The latest enrolment data from Canada reveals a big jump in international student numbers in the country in 2016. 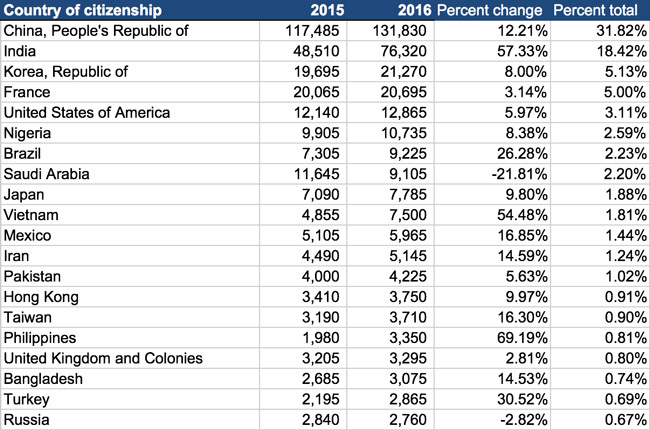 Speaking at the Canadian Bureau for International Education’s (CBIE) annual conference in Halifax, officials from Immigration, Refugees and Citizenship Canada (IRCC) reported a 17.5% increase in foreign enrolment in 2016. The IRCC reports there were 414,946 study permit holders as of 31 December 2016 (that is, those holding study visas allowing programmes of six months’ duration or longer). This compares to just over 351,000 students the year before, and amounts to a net increase in nearly 62,000 additional students in 2016. Ms Baroque also highlighted a notable spike in application volumes for Canadian colleges (i.e., post-secondary institutions offering one-year certificate, two-year diploma, and degree transfer programmes). While the number of study permit applications processed during the year increased by 6–8% for all other sectors – including secondary schools, language schools, and universities – colleges saw a 20% increase in application volumes in 2016. This bump in admissions activity for Canadian colleges balances against more marginal growth for Canadian language schools in 2016. As we reported earlier this year, the total enrolment reported by Languages Canada member-schools increased by 1% compared to 2015 with student-weeks booked falling off by 5% compared to 2015. Canada’s foreign enrolment continues to rely heavily on the key Chinese and Indian markets, and the two countries combined accounted for just over half (50.24%) of all international students in Canada in 2016. China and India also contributed roughly two-thirds of the total growth in student numbers for the year, with India the biggest single source of growth with a 57% increase from 2015. China grew more slowly (12% year-over-year) but on a larger base enrolment, and it remains by far the largest sending market for Canadian educators. As the following table illustrates, other major growth markets within the top 20 senders for Canada include Brazil, Vietnam, and the Philippines. Brazil rebounded from a one-year decline between 2014 and 2015 to record a 26% increase for 2016. This was enough to move this key Latin American market to the 7th-largest sender for Canada with a total enrolment of 9,225 students. Vietnamese numbers, meanwhile, increased by nearly 55%, reflecting the growing importance of this important emerging market. The number of Filipino students jumped by 70% to reach 3,350 in 2016. This establishes the Philippines as the 16th-largest sender for Canada, and reflects both the growing strength of the country’s economy as well as the very large Filipino community in Canada. Global Affairs Canada reported separately that there are roughly 800,000 Filipinos living in Canada currently. There are only two declining markets reflected in the top 20 table for 2016: Saudi Arabia and Russia. Where Russia registered a marginal drop for the year, the Saudi numbers fell off more sharply from 11,645 students in 2015 to just over 9,100 in 2016, for an overall decrease of nearly 22%. This reflects the ongoing “teach out” effect for the large base of Saudi scholarship students that have been enrolled in Canada – and in other leading destinations – over the last several years. Observers are quick to lay every shift in enrolment trends at the feet of US politics these days, and with particular reference to the policies and rhetoric of the current US administration. However, as was the case with the 2016 enrolment figures recently reported in the US, we cannot attribute the 2016 surge in Canada’s enrolment to President Trump’s electoral victory in November of that year. The effects of that remarkable political event will only be reflected in the 2017 results for the US, Canada, and elsewhere. Rather, the 2016 numbers reflect a continuing increase in Canada’s popularity as a study destination, a trend that we began to observe some years ago and that is being reinforced again in new research published this year. As we noted in our recent coverage, the 2017 ICEF i-graduate Agent Barometer found a notable increase in interest in Canada among prospective students (as reported by agents responding to the survey). Similarly, the latest IDP Student Buyer Behaviour Survey highlights a pronounced shift toward Canada in terms of student perceptions of the most attractive destinations for affordability, safety, graduate employment opportunities, and visa requirements. IDP’s research also reveals a high level of satisfaction among international students in Canada, with the vast majority saying that their study experience met or exceeded their requirements across several factors ranging from safety and affordability to quality of education and lifestyle to ability to work during or after their studies. In discussions with educators at the CBIE conference this week, it is clear that most see these current trends as a moment of opportunity for Canada. The competitive environment for international education is intensifying on a number of fronts, and for those recruiting international students for programmes in Canada, the country’s growing popularity is increasingly seen as a chance to strengthen Canada’s competitive position for the long-term. This entry was posted in Canada, Most Popular, North America, Regions and tagged language learning, student recruitment, international students, Languages Canada, education abroad.